We recently published a paper in Molecular Phylogenetics and Evolution on plumage evolution in one of the many clades of tanagers. This paper represents a side project of Allison Shultz’s thesis. In the paper, we describe a novel clade of tanagers that includes Hemispingus, Poospiza, Thlypopsis, and nine other genera. A variety of species are included in the group, some of which were traditionally considering tanagers and some of which were traditionally considered finches. Among the species in the group is the Pardusco, Nephelornis oneilli. The clade is illustrative of the taxonomic mess of tanagers as many of these genera are not monophyletic in our analyses. In addition to describing relationships of these species, the paper also looks at how light environment shaped plumage evolution in the group. We found that evolution of brightness follows expectations for selection based on crypsis and that more colorful plumage is found in closed in environments than in open environments. For a pdf, you can go to journal’s web site or just send an e-mail to kburns@mail.sdsu.edu. If you like this paper, there will be more to come as Allison is currently writing up her thesis papers on plumage evolution in all 370 birds that we now consider to be tanagers. Of four models of plumage evolution, one including open vs. closed habitats (highlighted in red) is preferred over the others. 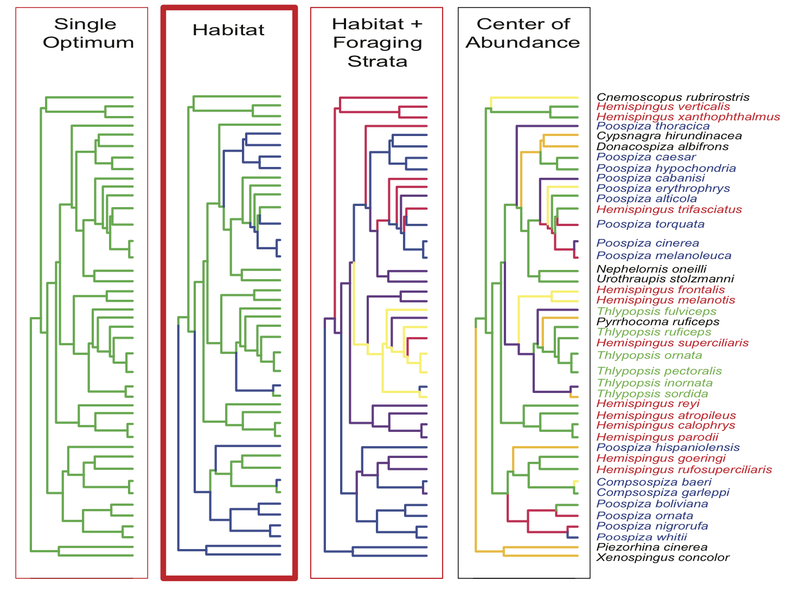 Species names on the left are color-coded by genera to illustrate widespread paraphyly within this clade of tanagers.